Kentoshi-sen (遣唐使) were the ships that carried the Imperial Japanese Envoys to China during the Tang Dynasty and Nara periods. Japanese envoys to the Tang Dynasty played an important role in international cultural exchange during the Asuka and Nara periods in ancient Japan. 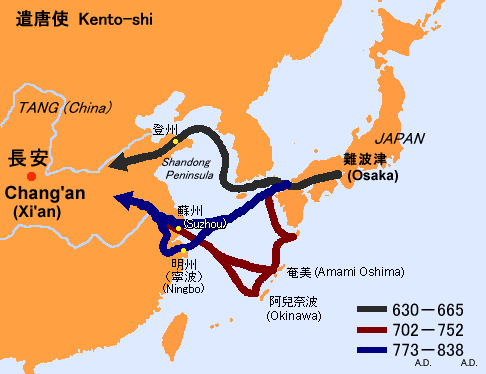 The cross-cultural exchanges began with 5 missions between 600 and 614, initially to Sui China (on kenzuishi-sen), and at least 18 or 19 missions were sent to T’ang China from 630 to 894 although not all of them were designated kentoshi. The last mission was in 838, which carried the priest Ennin on board the ship while a mission planned with Sugawara no Michizane in 894 had to be aborted because of turmoil in China thus ending the period of active diplomatic relations until the 15th century. 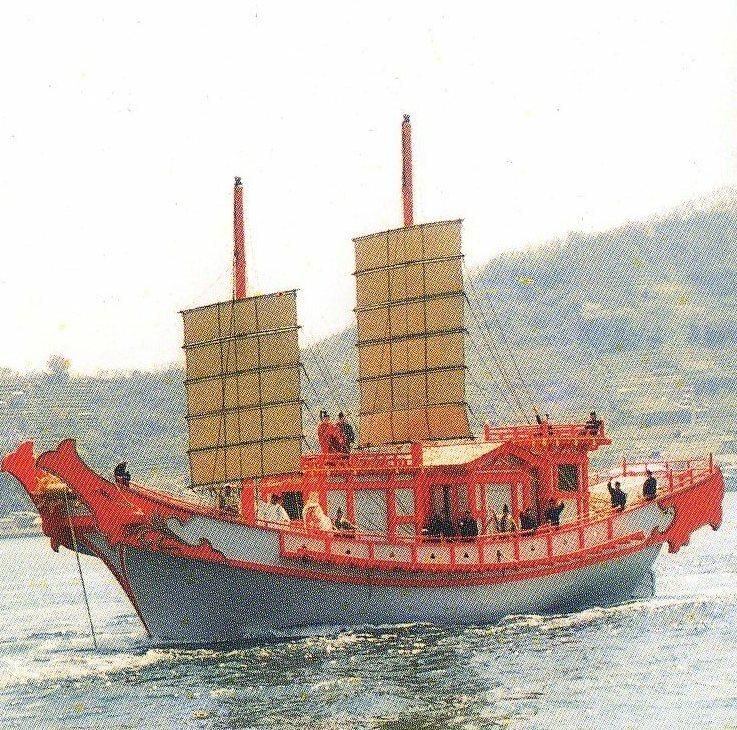 Japanese court officials, diplomats, scholars, engineers, Buddhist monks and merchants were sent via those ships to learn about Chinese culture, administration and institutions. Those that made the hazardous journeys back to Japan had great influence on Japanese culture and administrative reform, some of which found their mark in the Taika Reform of 645. The main purpose of these missions was the cultural exchange and trade with China. The missions included Japanese court officials, diplomats, merchants, engineers and many Buddhist monks and scholars. They brought many innovations and ideas back to Japan, including the Chinese vocabulary that came with many new ideas. Religious ideas as well as Confucian concepts flourished, so that many more temples were established by the returning monks. A boom of sutra copywriting and temple-building was the result one of the skills of scribes and new engineering techniques absorbed. Some of the architecture, pagodas and sculpture built from those early times have survived earthquakes and typhoon through to the present day. The ships carried precious cargo of glass, musical instruments, textiles, scroll writings, glass objects, many exotic curiosities — many of the items had found their way via the Silkroad, Persia, China and Korea to Japan. The items were treasured and used by the Imperial family or used during ceremonies at the Todaiji Temple. Many of the items were then donated upon Emperor Shomu’s death donated to Todaiji Temple and then housed in a specially built museum or treasure repository in Nara called the Shoso-In 正倉院. The Shoso-in building which is still standing in good condition is itself a national treasure. 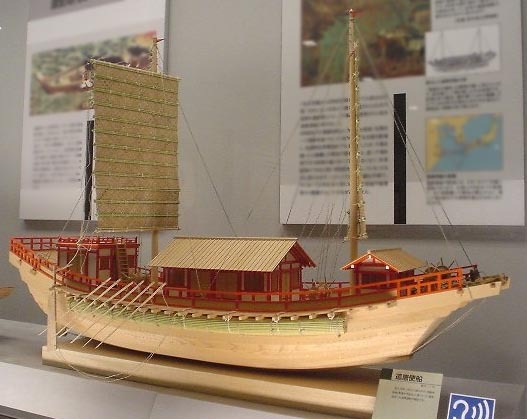 We know what the ships looked (see photo of model below) from images in the Toseiden emaki scrolls that picture Ganjin, a Chinese monk who came to Japan by Kentoshi-sen, propagate Buddhism and established the Toshodaiji Temple in Nara prefecture.